Katie Schofield and Natasha Hansen combined to qualify fourth in the women’s team sprint and will fight out for the bronze medal tomorrow. In their first outing together at any level, the women’s team pursuit, that includes teenagers Bryony Botha and Holly Edmondston, also qualified through to tomorrow’s competition. The men were not as fortunate with the team pursuit combination finishing 13th fastest and team sprint ninth. With New Zealand having gained excellent qualifying points towards the world championships in the opening two World Cup competitions, the final contest provided a chance to blood a number of young development riders, with most enjoying their first elite World Cup. Hansen, the London Olympian, made her return to international competition with usual starter Schofield in the women’s team sprint. Schofield produced her best start of the season in 19.055s which was the fifth best, before Hansen came home in 14.547s for a combined time of 33.602, the fastest time set by a New Zealand women’s sprint team. They watched as top seeds Great Britain, Australia and China went slower, to promote New Zealand into the medal ride-off for the first time. They take in Spain tomorrow for the bronze medal while Russia meet Netherlands for the gold medal. 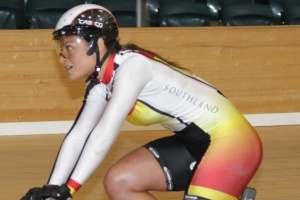 New Zealand debuted a rookie combination in the women’s 4000m team pursuit, with omnium rider Raquel Sheath providing some experience in the qualifying ride. Teenagers Edmondston (Waimate) and Botha (Auckland) along with Waikato’s Pip Sutton completed the combination that clocked 4:40.978s to be eighth fastest. They started conservatively to be 15th fastest at the midway point but a superb third kilometre in 1:07 promoted them forward, finally grabbing the last qualifying spot. They meet Germany in the second round tomorrow, with a chance to qualify for medals in the evening’s second rides. The young men’s team pursuit of last year’s junior world championship riders Nick Kergozou, Luke Mudway and Regan Gough along with Myron Simpson rocketed through the first kilometre in 1m05s, the second fastest, but they faded in the second half of the ride to finish in 4:09.726 to miss qualification. It was the same for the men’s team sprint with teenager Lewis Eccles and young Auckland hope Zac Williams joining Simon van Velthooven, managing a solid if unspectacular tome of 44.75s, which was ninth fastest. Tomorrow will see Sheath and Cameron Karwowski begin competition in the six-discipline omnium, Schofield rides in individual sprint qualifying, van Velthooven rides in the men’s keirin with the women’s team sprint and team pursuit chasing potential medals. Men 4000m team pursuit: Australia 4:04.106, 1; Germany 4:04.158, 2; Russia 4:04.405, 3. Also: New Zealand (Myron Simpson, Regan Gough, Nick Kergozou, Luke Mudgway) 4:09.726, 13. Women team sprint, qualifying: Russia 33.128s, 1; Netherlands 33.351, 2; Spain 33.429, 3; New Zealand (Katie Schofield, Natasha Hansen) 33.602, 4 (NZ Best). Men team sprint qualifying: Netherlands 43.613, 1; France 44.090, 2; Poland 44.340, 3. Also New Zealand (Lewis Eccles, Simon van Velthooven, Zac Williams) 44.750, 9.